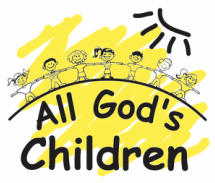 Our Preschool Childcare program is the newest addition to the All God's Children Family. There was a need in our community where parents needed preschool and all day care, so two rooms were created; one room for 16 3 year olds and one room for 19 4 year olds. We are open at 6:30 a.m. and close at 6 p.m. Although we are open for 11.5 hours, a child may be under care for no more than 10 hours per day. AGC provides a daily lunch which consists of a main dish, fruit, vegetable, and milk. This is included in the tuition. AGC provides a nutritional snack, one in the morning and one in the afternoon. Milk is provided. The children eat meals together and before each meal they take turns each week saying prayer. At the table they learn table manners and how to pour their own drink. It is interesting to watch how independent they become around the table after a year. There are multiple staff members in this room due to the amount of time children spend there. The staff schedule stays similar through out the year because it is important to keep consistency for the children in the childcare room. They become a family in that room! - An extra change of clothes left in the room (pants or shorts, shirt, underwear and socks) for spills and accidents. - A sunscreen and face-stick sunscreen. They may also bring hats or sunglasses if they would like. - A cot size blanket for nap time. If they would like a small pillow or a small stuffed animal, those are welcome as well. The item needs to come in a separate reusable bag with their name on it. This will be left in the room for the week. These items are sent home every Friday to be washed. Please return each Monday. - We will have a water day over the summer. Please bring a swimsuit and towel, with your child's name on them. - There will be a Bike Day over the summer as well, so please bring your child's bike, tennis shoes and a helmet (required by DHS). - With the weather getting as hot as it does, we would like to provide the option of a water bottle being available to your child all day. If you wish, please bring one with your child's name on it. This will be sent home every Friday to be washed. - To keep our families close to us all day, please bring a framed picture of your family to be displayed in our classroom all year round. There is a childcare cell phone number that is available to parents in case the children are out of the room such as playing outside or on a field trip. This number can be used to let the staff know that your child will be absent, late or any information relating to your child. We want you to know that you are able to reach your child at all times! We also offer Preschool Summer Care! Follow the link to learn more. All Tuition is collected via Electronic Funds Transfer (EFT) bi-weekly. The enrollment fee can be paid either by EFT or check. This fee includes a fee for supplies for the school year. There is are separate enrollment fee for the summer. There is a $20.00 Non-Sufficient Funds return fee. If for any reason you are in need of special payment arrangements, please discuss your needs with the Director. For more in depth information on All God's Children's Preschool Wrap Around Childcare, see our Handbook.